We are ready to cast off lines for our second cruise this year. 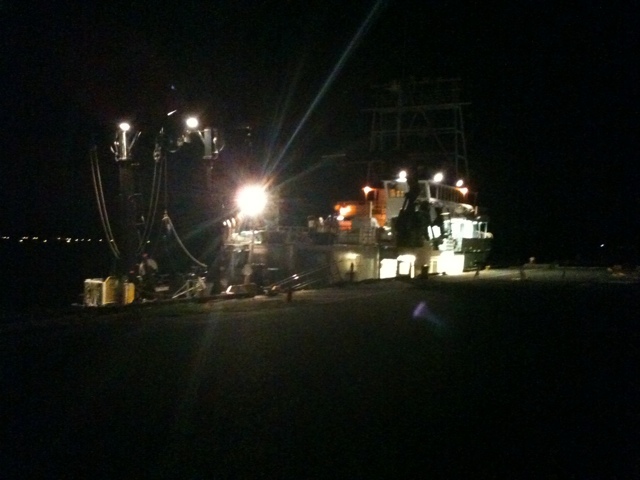 Updates to follow, but we should be sampling by dawn. It has taken me a little longer this year than it did last year to get the hydrographic data together from our May cruise in the Chesapeake Bay, but I’ve finally gotten some of it up. The results of our two surveys are below. We ran into some unexpected problems with the Scanfish so the first survey was completed using data from the Scanfish as well as a series of CTD casts approximately 4 miles apart. By the end of the cruise we found we had a little extra time and everything was working well so we completed an abbreviated survey from our northern station south to near the mouth of the Potomac. This was a survey of convenience, but it seemed to work well with our cruise plan so we will try to incorporate it into subsequent cruises. 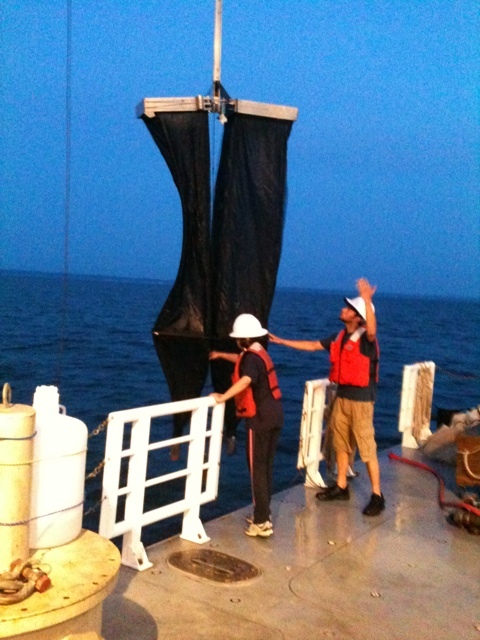 Scanfish and CTD data collected on 25 May 2011, during DeZoZoo 1101. One big reason to incorporate a second survey at the end of the cruise is evidenced by the data we generated, and the differences between the two surveys, taken just 6 days apart. It may not be abundantly clear looking at these graphs on the computer, but there were some fairly substantial changes in temperature and dissolved oxygen between these surveys. The surface water temperature warmed up a few degrees between them, and while some of the increase was likely due to the hot weather we had during the cruise, much of it was also likely due to advection of some water masses out of the Bay in the surface outflow. But we will save that for the physical oceanographers to tell us. Another reason I think it might have been water moving is because the salinity looks like it changed a little bit too- saltier in the northern part of the transect on the second survey. Scanfish data collected on 30 May 2011, during DeZoZoo 1101. The two other data plots are what we might call “non-conservative” tracers. This means that they vary in different ways. Physical oceanographers use this term for things that are affected by biology, including dissolved oxygen and chlorophyll fluorescence (of course – since it’s found in algae!). We wouldn’t use these measurements alone to trace water masses, but along with the “conservative” tracers like temperature and salinity, we can learn something about where the water is moving. In this case I do not think that the dissolved oxygen tells us much about the movement of water, because this is the time of year we would expect the biological activity of the bacteria in the deep water to be drawing down the oxygen. Similarly, the fluorescence is likely changing as much due to growth and death of the algae as it is by water movement, so we wouldn’t conclude much about the currents from the fluorescence data. However there are some interesting patterns in those data plots, if we compare between the first and second surveys. First, the dissolved oxygen seems to have dropped slightly over 6 days. It was already lower than I expected, and certainly lower than the same time last year. Unfortunately we were unable to do a survey all the way south, so we do not know how far the hypoxic water (less than 2 mg per litter) penetrates. The fluorescence values are plotted as relative to the maximum fluorescence because we have not yet calibrated these sensors with actual chlorophyll measurements for this cruise. This means we can’t say anything about whether or not the fluorescence increased or decreased between surveys, but we can look at the changes in distribution between them. In the first survey chlorophyll fluorescence was high in the north and most of the high values were in the surface waters. By the second survey the maximum chlorophyll fluorescence was found right on the pycnocline – or the region of the water where density changes. 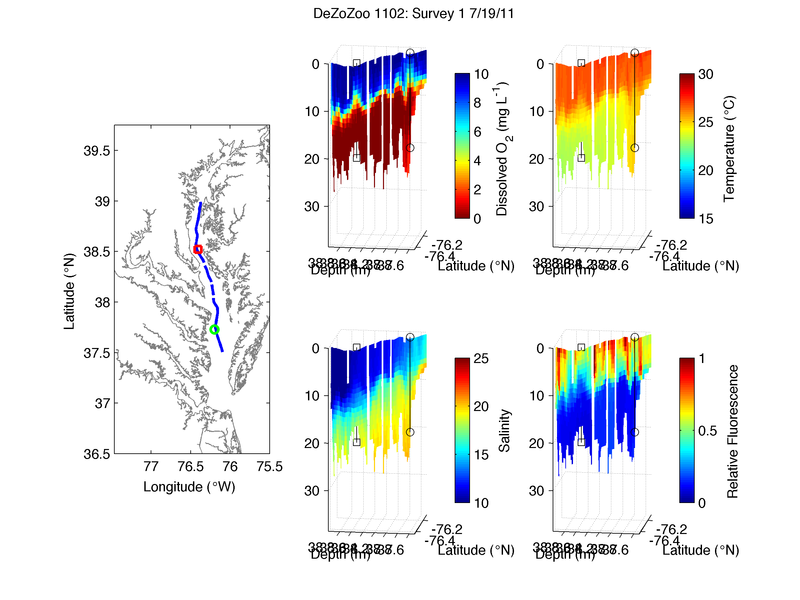 If you look at the other three plots from the second survey, you will see that somewhere between 8 and 12 m deep, each variable – temperature, salinity, and dissolved oxygen – change, and right in this same region we see the maximum chlorophyll values. This is the kind of pattern we often think of as occurring in summer. So what will our July cruise have in store for us? I am not sure, but I would guess that we’ll see very strong evidence of hypoxia and perhaps even anoxia. 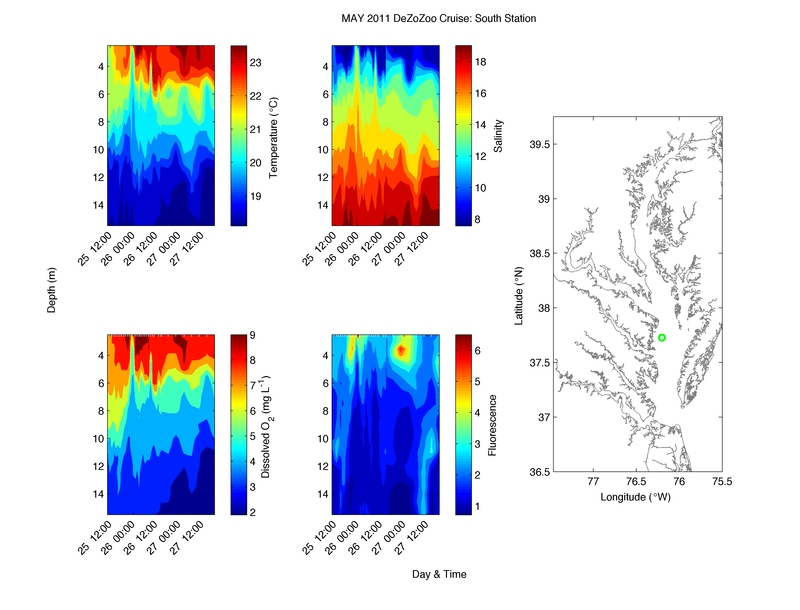 The salinity is still low near our northern station (I have it from good authority from other researchers sampling near the mouth of the Choptank River), and that may affect the jellyfish populations by delaying them a bit. Temperatures should not be a problem for bay anchovy spawning or jellyfish growth, but the combination of very low oxygen and salinity could mean something different from what we saw last summer. Should be interesting, so stay tuned! We’ll be out in late July and perhaps get some updates from our colleagues that are out there in the next two weeks. 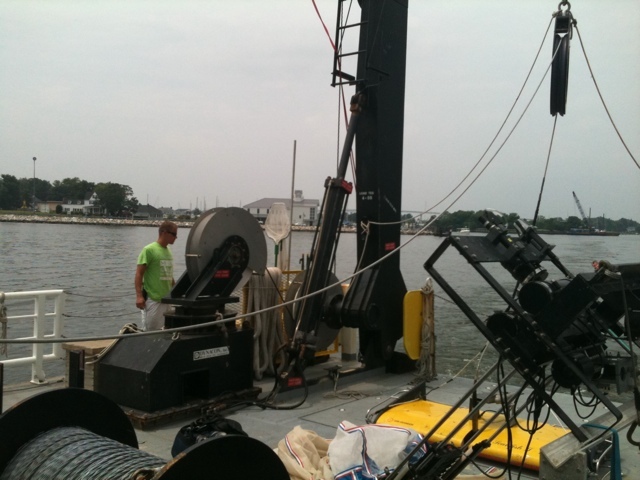 The Scanfish is back in the water for the last operation on this cruise! We’ve been dealt some tough hands on this cruise, but as I write this we just finished another series of net tows and wrapped up a few experiments in bright sunshine and light winds. The Memorial Day festivities appear to be in full swing on the pleasure craft, as evidenced by the sails dotting the horizon and clusters of sport fishing boats to the north of us. 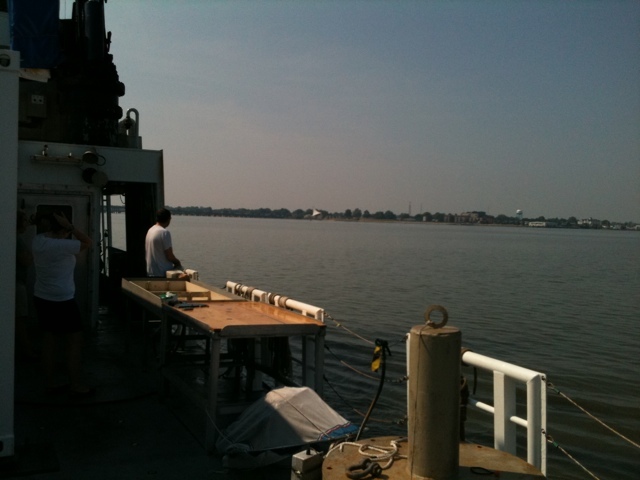 As nice as it would be to be attending a barbecue with the family or “sampling” the nekton with a rod and reel, it’s awfully nice to be out here with a great crew doing cool science. 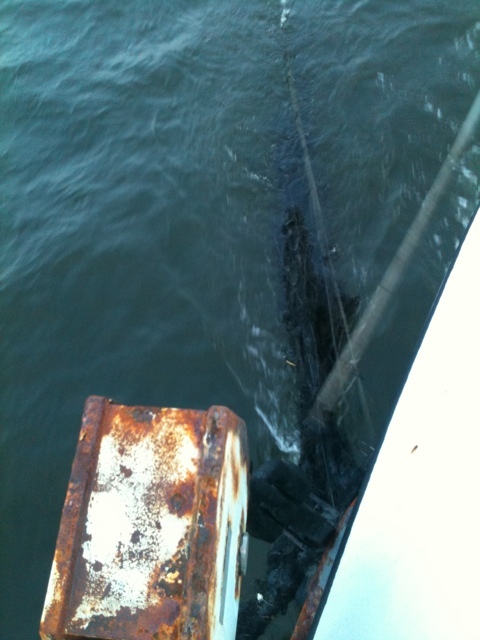 As far as our science goes this lovely Monday morning, we seem to be seeing sulfide laden deep water. I’m not a marine chemist, but I’m pretty sure this is somewhat early for sulfidic water to be present, particularly this far south. We’ll try to get some samples to determine the amount of sulfides present, but we weren’t planning to do that so it may take some creative thinking. So why do we care about that? Well, low oxygen can really stress organisms but sulfides are toxic. Our colleagues who work on these things are interested in what ions organisms use as electron receptors for energy. In simplest terms, everything but the tiniest microbes rely on oxygen because it has the highest energy per molecule. As oxygen gets used up, certain organisms can switch to lower energy compounds like nitrates and things like that. Once all the oxygen is used up there is a bit of a lag and then some of the organisms that can do it begin to switch to using sulfides as their terminal electron receptor. The byproduct of that chemical process is H2S, or hydrogen sulfide which is lethal to most organisms. Some microbes have mechanisms to deal with it, but metazoans (multi-cellular organisms including plants and animals) do not. In fact, even low oxygen is lethal to many metazoans before the switch to sulfide occurs. Hence the title of this post. Our deepest samples are nearly devoid of the copepods, fish larvae, and other zooplankton we are catching just a meter or so above the deep samples. So there might be microbes, but not much else alive down there. I’ll try to get some more pictures up this afternoon. We’re going to finish up the net tows around dinner time and then try to get back some of our aborted Scanfish survey before heading home. Then we’ll hopefully get to enjoy some of those barbecue leftovers tomorrow evening. We did have some spectacular, and I mean truly scrumptious, brisket with fingerling potatoes and collard greens last night that seemed awfully appropriate. Our cook on this trip is sailing as relief for the regular cook, and her full time position is on a California research vessel, but the interesting part is that she has a blog about her life as a research vessel cook, food, and travels. Check it out here. 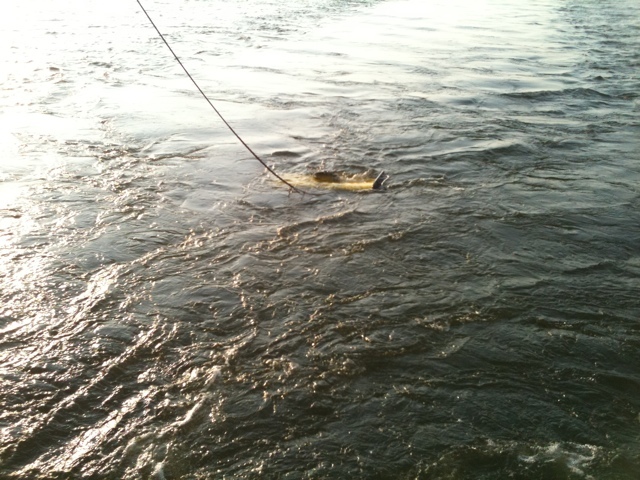 Just when things were moving along swimmingly, the captain pulled the anchor so we could start our net tows and SURPRISE! Old gill nets and crab pots are tangled on the anchor. The crew have been trying to free it using boat hooks an other long handled implements, but it looks like they will have to put in the small boat. One concern of the captain’s is that we can’t just leave it for the next poor sailor to be waylaid. Our plankton will be there when this sorted out. Safety first of course. Our beloved and temperamental Scanfish did not cooperate on our first day, so we don’t have the nice images of conditions that I usually make on the cruise. Instead we did CTD casts every 4 miles or so. A Scanfish is pretty much just a CTD that swims up and down behind the ship and can be towed at 5-6 knots, whereas a CTD is simply lowered from the ship to near the bottom and retrieved. The CTD can collect water though, so each instrument has its advantages. But I digress. The reason I’m describing the differences is because I finally was able to plot up some of the data from this cruise and I think it tells an interesting story. Instead of focusing on the CTD casts from our transect that took the place of the Scanfish survey I plotted up all the casts from our southern station – the one that is supposed to be more oxic. That data is shown in the plot below. The four panels with contour plots show temperature, salinity, dissolved oxygen, and chlorophyll fluorescence. Time is on the x-axis and depth is on the y-axis. The colors for all plots range from low values in blue to high values in red. On the right is a map with the station location of these samples clearly marked. 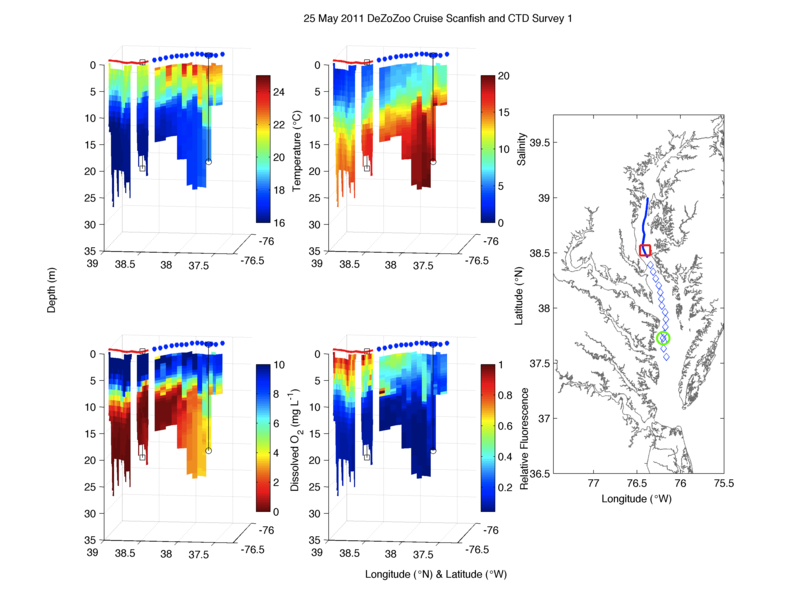 CTD contour plots from the south station in May 2011 (DeZoZoo cruise 1101), including temperature (upper left), salinity (upper middle), dissolved oxygen (lower left), fluorescence (lower middle), and a station map (right). What I see in these graphs is that during the two days at our station the surface water warmed considerably – from about 20C to nearly 24C – while the dissolved oxygen in the deep water decreased. Salinity did not seem to change too much, though the depth of the interface between low and high salinity water shoaled (or became shallower). Fluorescence was patchy, with evidence of a rather large bloom at one point.